Following is an excerpt of the WWU Tools & Techniques for Course Improvement. These documents have proven to be the most popular web pages on the CIIA's online collection of resources. 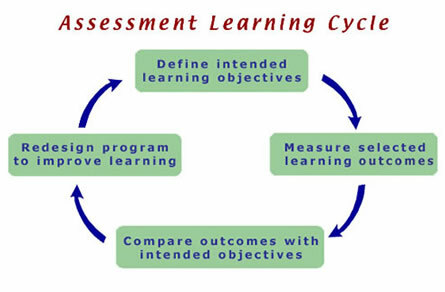 Assessment is an iterative feedback process for continual program improvement, based on the model shown below. Step one is to define intended program learning objectives: specifically, what do we want our graduates to know and actually to be able to do? Step two is to define measurable outcomes that will serve as evidence of how well each objective has been met, and then actually to measure them. Because this step requires explicit articulation of program success criteria, it often has the added benefit of clarifying faulty assumptions. Step three is to compare actual observed outcomes to intended program objectives: how well did we meet our objectives in general, and our student learning objectives in particular? Finally, in step four, based on how well or how poorly achieved outcomes compare to intended outcomes, elements of the program (including assessment elements) are redesigned as appropriate, and a new assessment cycle begins. The assessment cycle is an integral part of student-centered education. It provides an ongoing mechanism for challenging tacit assumptions about program effectiveness, identifying conflicting program elements, and assuring that student learning objectives are met. It also allows for evolution of program goals over time. Although it is by no means an easy task to define learning objectives and measurable outcomes for an educational program, faculty engaged in the process inevitably and uniformly are rewarded by identifying with heightened clarity what it is they are trying to accomplish and how they can better go about it. An assessment process should be logistically feasible and practically manageable to insure that it is regular and ongoing. What is important varies by program and program level, and program competencies are often sequentially developed; general education competencies tend to be first steps in the development of a range of integrative abilities across the curriculum. In Washington State, four such integrative abilities are being explored in considerable depth to find consistent methods of assessing how well graduates of Washington schools have mastered them: writing, information technology literacy, quantitative reasoning, and critical thinking. All of these educational goals involve general skills or abilities that the legislature has implied should be developed in a Washington State public college education. This development begins with the general education curriculum, but continues at higher and more integrative levels in the major. Clearly major programs must focus on developing the specific competencies of their fields; but they also have responsibility to develop in their students this broad range of general abilities. See the rest of the online version on the CIIA's website. See also: Assessment of Student Learning Outcomes (by College, Department, and Program).